Uncertain, trembling voices filled with confusion, despondency and despair will stumble and stutter as they try to explain what it all means. HELP! WHAT IS IT? I DON’T UNDERSTAND! Business owners, marketers and service providers are all asking what GDPR means and how it’s going to affect their business. There’s has been a great deal of panic over the new GDPR legalisation that’s coming into play on the 25th May and I can understand why. GDPR is actually a GOOD thing, a really good thing. In simple terms the aim of this policy is to give all of us a much greater understanding of how our data is used by businesses. It’s also designed to give us more user-friendly means of tweaking and deleting permissions. The problem is we’ve done all this at warp speed from within the framework of old offline, bricks and mortar regulations. It’s no longer relevant. The landscape has changed dramatically and we needed a clearer set of digital guidelines and regulations. GDPR has at least helped to jump start that process. With the new legislation in place unscrupulous cowboys swiping, stealing and sharing data in nefarious ways and spamming the living daylights out of everyone are more likely to get stopped in their tracks. 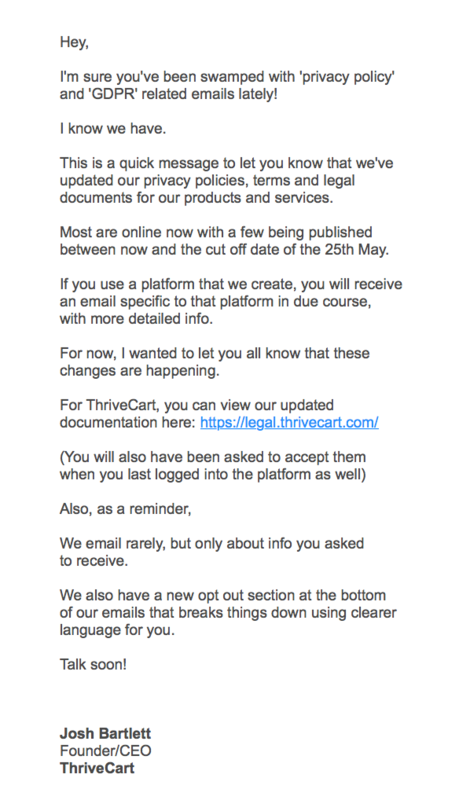 Sure, they may not take a blind bit of notice about the new rules but you can be sure that the email providers and third parties they use will. These juggernauts have been quietly building empires with our data and crowding out the little guy with their spy-agency like knowledge. As we’ve seen lazy data storage practices and security breaches have led to global hacks, ransomware and even election manipulation. Anything that begins to address these issues has to be a positive step. It’s not a silver bullet but it’s a step in the right direction. This is a free Facebook group run by one by Suzanne Dibble, one of the UKs leading lawyers. Last time I checked there were almost 30,000 members in this group and it’s lively and switched on resource. You have to request to join, but all this involves is answering a couple of questions and they’ll manually approve you within a day or so. Next I want to look at some of the different approaches businesses are taking in alerting their readers to changes in GDPR policy. As well as being good practice this also helps to ensure that they are showcasing their transparency and updated privacy policies – and thus staying compliant. These are some of the more interesting ones I’ve received or been passed on. We’ve got a real mixture here – a food delivery app, 2 tech companies, a political party and an airline. 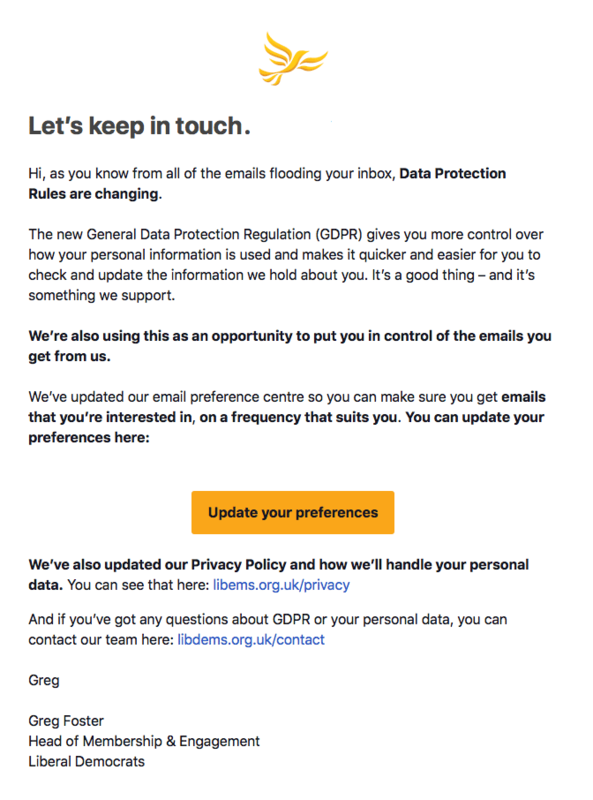 As you’ll have seen, not all GDPR explainer emails are created equally and if you’re creating one for your own readers hopefully some of these will give you some inspiration. There’s no messing about with this one and the emphasis is placed on getting you to click on the link. Thrive take a friendly, conversational approach with theirs. They disarm the reader by acknowledging that you’ve been inundated with these kinds of emails, then go on to point you towards the relevant information and highlight the key changes they’ve made. This one suits the tone of their brand and is open and transparent. 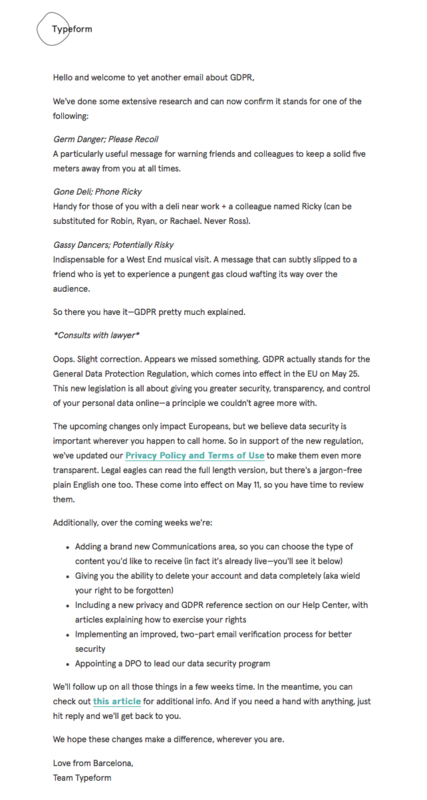 Typeform are a fun and trendy company (ugh that makes me sound old) and they’ve put some personality into their GDPR explainer email. The downside is that it does make it quite long but I think it works within the context of what they’re trying to do. 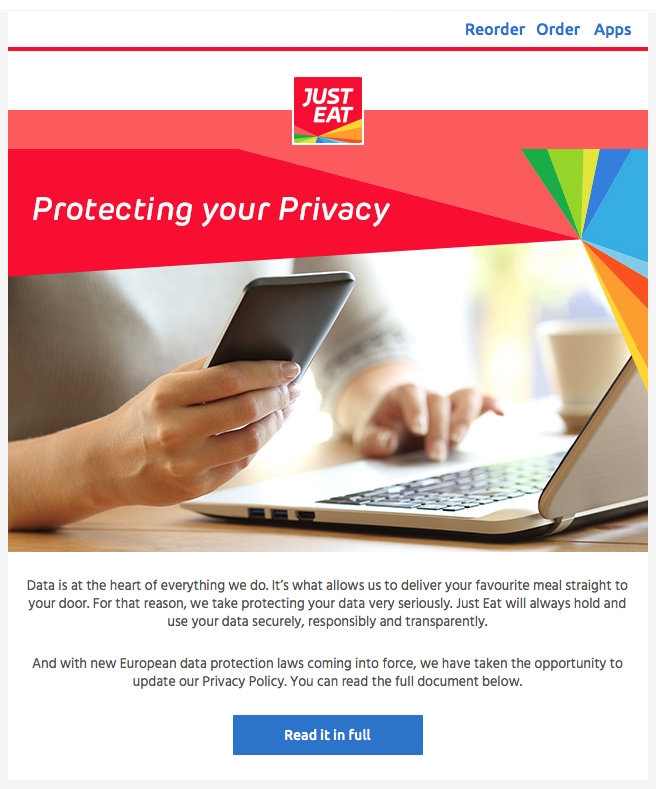 I thought it was worth including an example of a GDPR explainer email from a political party. A reader kindly sent this one through from the Lib Dems. The wording and formatting they’ve used here ensures the content is clear and stands out while the tone is still friendly and informal. There’s also big call to action where you can update your preferences. 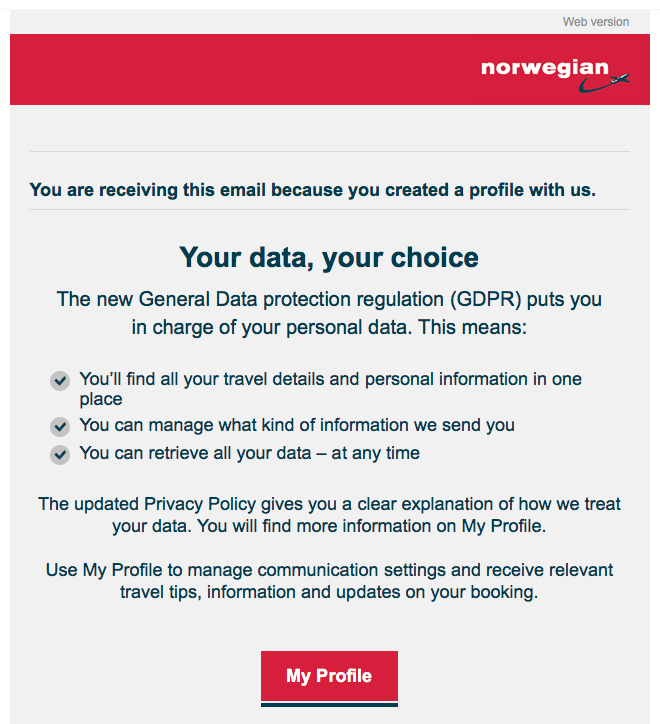 Norwegian airlines have gone for the short, sharp, simple approach. Bullet points clearly outline the changes that will affect you and there’s a link to your profile where you can make changes and find out more. This is a good example of a GDPR explainer that fits on one screen and doesn’t require scrolling. I hope you found these examples helpful. For most businesses GDPR should simply be a case of getting their house in order. It’s about checking and reviewing how you handle data and ensuring your privacy and cookie policies are up to date and in-line with the new legislation. This legislation is really taking aim at dodgy businesses using slap dash data storage techniques and using/sharing our personal details in sinister ways… as well the Internet giants playing god with our details. Despite the doom and gloom surrounding GDPR this is a good thing! Have you had any weird and wonderful GDPR emails in your inbox recently? Please leave a comment below. Thanks Lou, that’s very kind of you to say. So glad you’re finding it helpful.